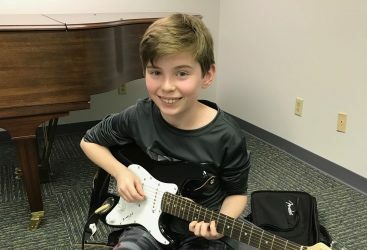 Electric Guitar is an Awesome New Hobby for Young Student! 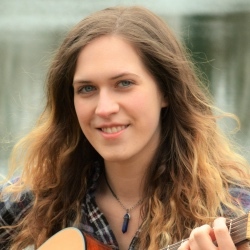 We often feature students who have been taking lessons for a year or more, but we love to share stories about students who are just beginning to discover music. 6th grader Colin Vinson has been taking lessons for 6 month with Saul Meyerson-Knox in the Guitar Department. Colin was a beginner to music and Saul encouraged him to learn to read music from a traditional method book along with the songs that he was excited to play. This two-part system develops a strong musical foundation while allowing students to enjoy the less formal side of music study. Colin has a wide variety of interests and has been able to explore many different kinds of music in this lessons. With Saul, Colin has learned to play guitar riffs from the Beatles “Day Tripper” and “Lucy in the Sky with Diamonds” and other classic rock hits such as “Iron Man,” “Smoke on the Water” and “An Other One Bites the Dust”. In addition, Colin has learned to play the theme music to different movies including Start Wars and Pirates of the Caribbean. Even after a short period of lessons, Colin is halfway through his first method book and developing the skills that will allow him to enjoy music for many years to come.